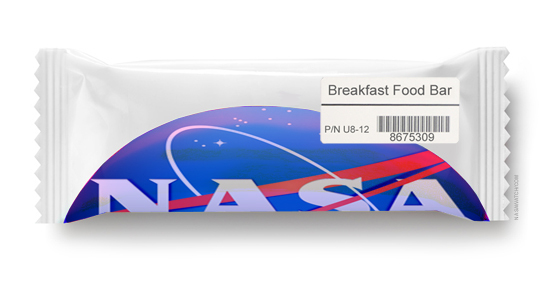 \n\nSpace Food Bars Will Keep Orion Weight Off and Crew Weight On, NASA\n\n\"To help reduce the amount of supplies Orion will carry for its crew, scientists are developing a variety of food bars that astronauts can eat for breakfast during their spaceflight missions. In the United States, it's common for people to substitute an energy bar or shake for breakfast, or to skip the meal all together. Food scientists determined that developing a single calorically dense breakfast substitution can help meet mass reduction requirements.\"\n\n Keith's note: Why is NASA spending money on a big fancy kitchen to produce something that I can buy at REI? Why doesn't NASA do Space Act Agreements with companies to figure all of this out - at their own expense - and give them the ability to put their logos on the snack bars we send on the #JourneyToMars ?\n\n Keith's note: according to this NASA article \"There's no commercially-available bar right now that meets our needs, so we've had to go design something that will work for the crew, while trying to achieve a multi-year shelf-life,\" said Takiyah Sirmons, a food scientist with the Advanced Food Technology team at NASA's Johnson Space Center in Houston.\"\n\nSo I have asked NASA \"Can you provide me with a copy of the specific NASA nutritional and storage requirements that you are using as the basis for developing the food bars mentioned in this article?\"\n\nLet's see if they release this information or try and keep it secret and force me to file a FOIA request. This page contains a single entry by Keith Cowing published on November 23, 2016 11:04 AM. Guessing About Military TrumpSpace was the previous entry in this blog. Wasting The International Space Station On The #JourneyToMars is the next entry in this blog.